Since painting originated, there have been vast improvements in the supplies used. The great masters of painting did not have access to the advanced technology and quality of the supplies available today. They also did not have any secret supplies which allowed them to create such masterpieces. The masters used standard supplies (by current standards) with great skill. If you are just starting out in painting, you should just purchase high quality basic supplies and learn how to use them well. There are many specialty tools which you should not even consider until you are more advanced, if at all. Do not fall into the trap that you must know how to use every material available. As a beginner it can be very overwhelming deciding what paint brushes to purchase, so I would recommend purchasing a starter brush set as this will have all the essentials. You can then get a feel for what brushes you naturally prefer to use. Paint brushes come in many different bristles and shapes. Some brushes are great all rounders which you can use for most situations, whilst others are more of a specialty brush (such as the fan brush which is great for painting grass and trees). Hog Bristle Brushes are stiff, springy and economical. 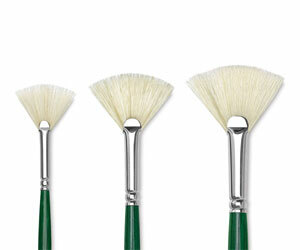 These brushes are well suited for oil painting given their durability and stiffness. Sable Bristle Brushes are not actually made from sable hair but rather from the tail of a species of mink (a member of the weasel family) found in North-Eastern China and Siberia. Sable bristle brushes are extremely fine, springy and hold lots of water, making them perfect for watercolor painting or fine oil / acrylic painting. Sable bristle brushes are expensive and I would not recommend starting with these brushes as a complete beginner due to the cost (unless you are rich, in which case you can do whatever you want). 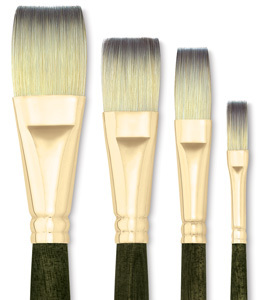 Synthetic Brushes are economical and versatile options for all painting mediums. Most synthetic brush manufactures will combine synthetic bristles with animal bristles to make for an economical yet reasonable quality paint brush. However, please note cheap synthetic brushes are often not durable and will lose shape quickly. Filbert brushes are a personal favorite due to versatility. It is somewhere between a round and flat brush. The curved tip allows for soft brushwork and blending. I use the filbert brush for any general brush work. 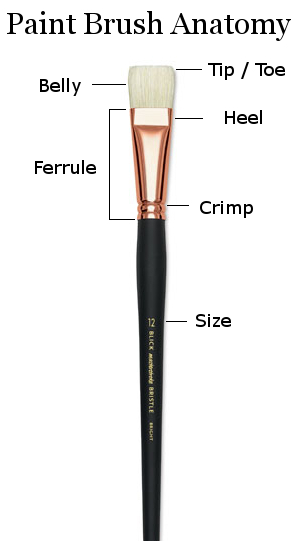 Flat brushes have a flat tip and can be used to make long, consistent strokes or for line work. Flat brushes are great for blocking in solid shapes of color (i.e roads, fences, buildings, etc). Fan brushes I find to be more of a specialty brush. They have a range of special uses, such as painting the leaves on trees or adding texture to grass or rocks. 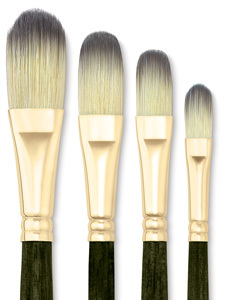 Fan brushes are essential for all landscape painters, but not so much for portrait painters. It is important to have a range of large, medium and small brushes. I heard a saying once along the lines of “begin your painting with a broom and finish with a toothpick”. This simply means start a painting with your largest brush and, as you get more detailed, bring out the smaller brushes. There will be variance in your painting from using large and smaller brushes. For staining the canvas, I use the largest flat or filbert brush I have. For sketching the composition, I will use a medium sized round brush (or sometimes even a fan brush if I want a very rough landscape sketch). For blocking in general colors and shapes I use a medium / large filbert. Sometimes I will use a flat brush if the shapes are very angular. For adding detail, I use smaller filbert and round brushes. I will also use the fan brush in certain situations, such as for painting leaves, grass or water. For signing the painting and adding very fine details, I use a small / medium round brush. 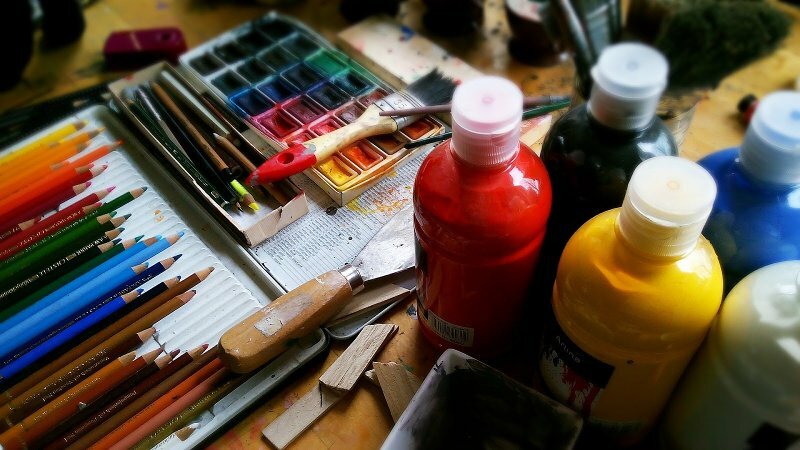 There are three main types of paint - oil, acrylic and watercolor. For the purpose of this guide, we will just be discussing oil and acrylic paints. Oil and acrylic paint is essentially ground pigment bound together using some form of binder. What quality - student or artist? The brand is not that important. Experiment with different brands and get a feel for which you prefer. The quality of the paint is a much more important decision. You generally have two choices - student or artist quality. As a general rule, I suggest always using artist quality. It does make a noticeable difference. However outside of this, you do not need to buy the most premium quality handmade paints of the finest pigments. You will probably not notice much difference between these very expensive premium paints and the standard artist quality paints available at your art store. Student quality paints are generally made for schools and children, many of which may not even enjoy painting. The third question is what colors to buy. This is a tricky one, as there are so many fantastic colors to choose from. When starting out, you will probably want to grab every color to give you as many options as possible. However, once your knowledge of color theory and mixing develops, your color palette will probably reduce. The bare minimum color palette you should have is the primary colors (yellow, red and blue) plus white. Black is optional, as you can mix a decent black by combining all three primary colors or blue and raw umber. Canvas is the most widely used material to paint on. When buying canvas you need to ensure the canvas has already been primed (unless you plan on priming it yourself). By primed, I mean ready to paint on. You can prime a canvas using gesso, which is similar to a white acrylic paint, but it is generally thinner and dries harder. The purpose of gesso is to stop paint from sinking into the canvas weave which would quickly deteriorate the canvas and provide a responsive surface to paint on. There are many different types of primed canvas so I will try an keep this simple. If your budget allows, you should invest in artist quality canvas, rather than student quality. The difference is noticeable. You will have the choice of stretched canvas panels, which are generally ready to hang and canvas boards, which are inexpensive but not recommended for exhibition works. Stretched canvas panels come as deep or thin edged. Deep edged gives a more modern appearance and is great if you do not intend on framing your painting. The thin edged stretched canvas is more suitable if you plan on framing your painting. In relation to what size of canvas you should paint on, that is really up to personal preference and the purpose of painting. For exhibition pieces, you may want to paint on a larger canvas so it has more impact. If you are just practicing, then a smaller canvas may be more suitable. I wrote more about canvas in this post. 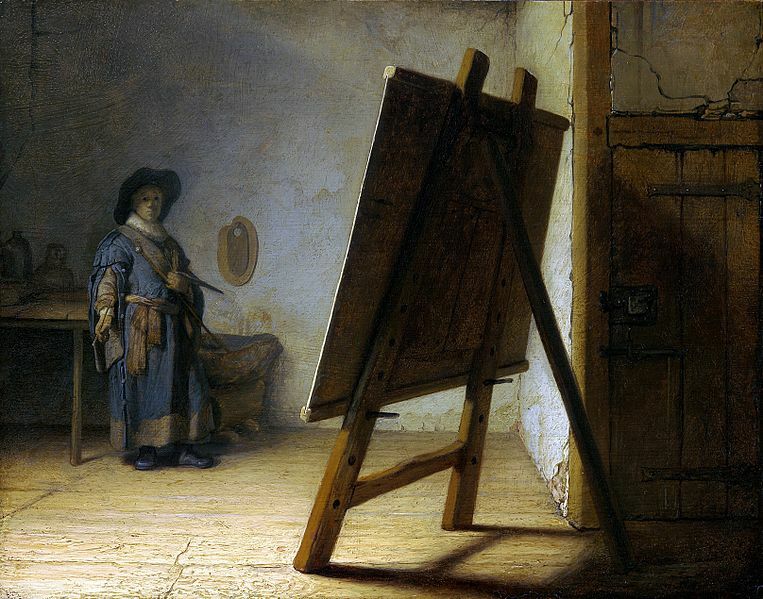 An easel is a wooden or metal stand used for holding a canvas, board or panel. There are many different types of easels, with varying levels of stability and mobility. A- Frame - a three legged easel which is economical and portable, however it lacks in stability. H Frame Easel - your standard studio easel. The H Frame Easel is sturdy but lacks portability. Giant Easel - basically a larger version of the H Frame Easel, used for large scale studio works. Convertible Easel - a versatile easel which 'converts' between a standard upright easel and a horizontal, tabletop easel. Single Mast Easel - the most basic and affordable type of easel. However it is also the least stable. Tabletop Easel - great for if you prefer to work at a desk. French Easel - the built in storage makes the French Easel a favorable choice for plein air painters. Display Easel - merely for 'displaying' your finished works. This easel is not suitable for painting on. Children's Easel - an easel specifically built for children. 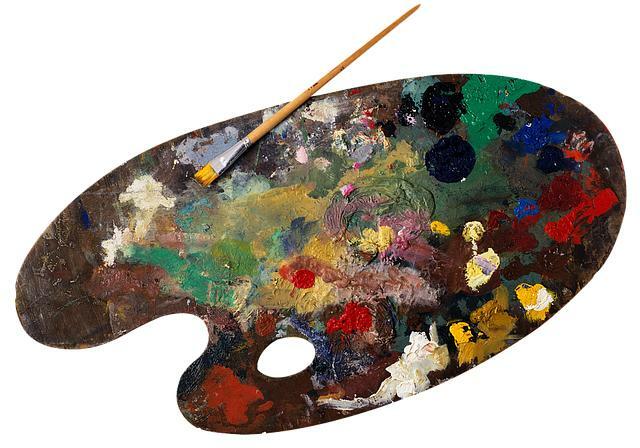 The palette is what you use to hold and mix your paint. The palette comes in many different forms, including your traditional wooden palettes, disposable palettes and standing palettes. If you are just starting out, I suggest you give the toned disposable palettes a try. They are economical and make cleaning up a breeze. These supplies are for oil painters only. Oil painting is a fine balance between solvent, which thins the paint and oil medium, which fattens the paint. A general rule in oil painting is to paint fat over lean, which means the later layers of paint must contain more fat (oil) than the earlier layers. This is to avoid the paint cracking. In practice, oil painters will often start with very thinned paint using lots of solvent. This first layer is almost nothing more than a wash of color. For each subsequent layer, more oil and less solvent is added to the paint. 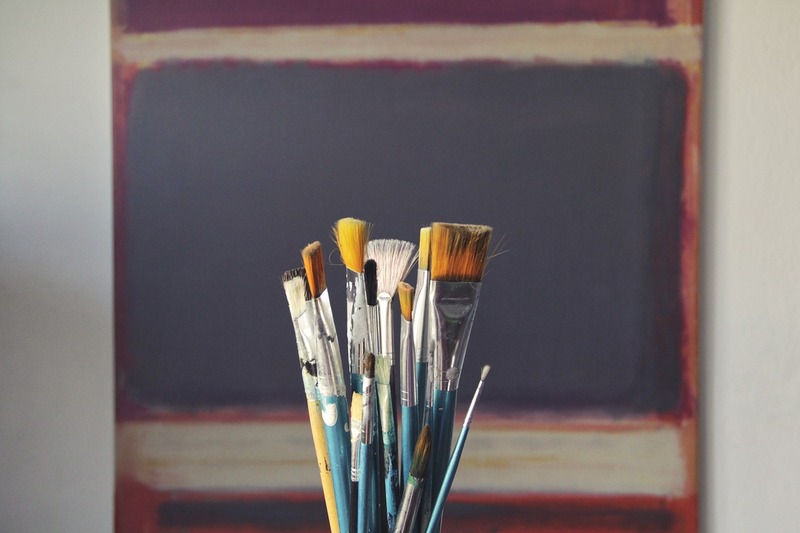 Most beginner artists think palette knives are just there to mix your paints. But they can be a great tool in your arsenal if used correctly. Some artists solely use palette knives to create rigid, broken color paintings. Palette knives are also much easier to clean and can really speed up painting times. You can read more about using the palette knife in this blog post. Large Cheap Paint Brushes - great for quickly covering a canvas without having to worry about damaging your brushes. Paper Towels / Rags - an absolute essential for cleaning your brush between strokes (this will make sure your colors are not muddied on your brush). Cups / Jars - for holding your water / solvent / oil medium. Tape - useful for covering areas on your canvas which you do not want to be painted (i.e if you want the edges on your thick edged canvas to be crisp white, then you can place tape around the edges and remove it once finished painting). Quality matters. If you are on a tight budget, then I would invest in high quality brushes first, paint next then canvas. These materials are the best bang for your buck in terms of quality. The master painters did not have any secret supplies for creating their masterpieces. They used basic supplies with great skill. Save money on paint by learning color theory and how to mix your own colors. You can paint with as little as the three primary colors plus white if you wish. Take care if your paint brushes. They are fragile but will last much longer with good care. If you have any comments, please share them in the section below.